In small bowl, mix all Yum Yum Sauce ingredients. Cover and refrigerate until ready to serve. In shallow dish, mix cornstarch and salt. In another shallow dish, beat egg. In third shallow dish, place bread crumbs. Holding shrimp by tail, coat with cornstarch; dip into egg mixture, then coat with bread crumbs, pressing to adhere. Place shrimp on parchment in air fryer basket, standing shrimp against sides of basket if necessary. Set to 350°F; cook 4 minutes. Carefully turn shrimp; set to 400°F, and cook 3 to 5 minutes longer or until pink. Sprinkle with cilantro. Serve with sauce. Holding shrimp by the tails when breading keeps hands cleaner and makes shrimp easier to coat with the breading. 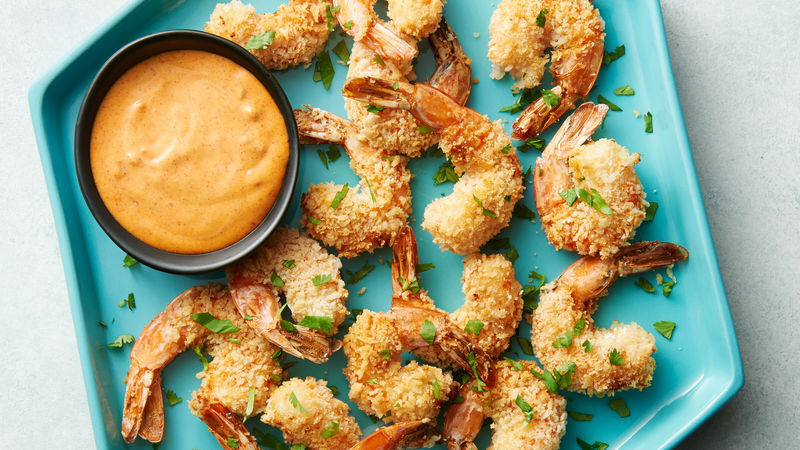 Panko bread crumbs create a fluffy, tempura-like breading for these easy shrimp.